LEN - www.lankaenews.com | Two hoodlums Weerawansa and Prasanna notorious for making August assembly a bedlam suspended ! 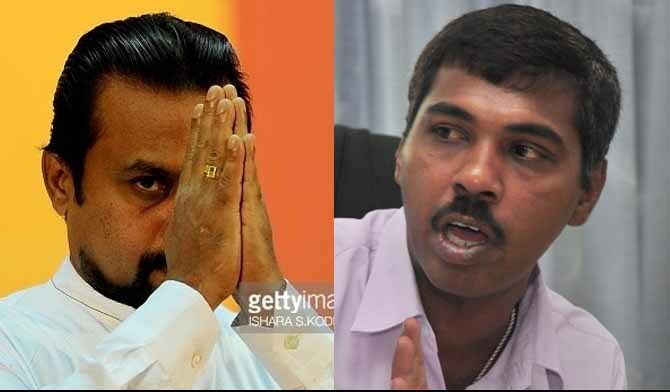 (Lanka e News – 22.Sep.2018, 11.30PM) Two notorious rowdies Wimal Weerawansa and Prasanna Ranaweera who call themselves as honorable members of parliament shamelessly , but best known for their worst hooliganism within parliament were suspended by the Parliament privileges committee over their disgraceful conduct in parliament on July 3 rd. These are the hoodlums who make the August assembly a bedlam . HoodlumWeerawansa was suspended from sittings for two weeks while the other hoodlum Prasanna Ranaweera was suspended for four weeks. The resolution of the privileges committee to punish them was tabled in parliament by the leader of the house…..
Hon. Speaker , in accordance with the recommendations made in the first report of the select committee on code of ethics and privileges tabled in parliament on 2018 -09-05 , under the parliamentary standing order 77(1) , I am tabling the resolution for the temporary suspension of the services of Wimal Weerawansa M.P. for two weeks. There were 41 votes for and 21 votes against the suspension of Prasanna Ranaweera , and 39 votes for and 21 votes against the suspension of Wimal Weerawansa . Accordingly these two hooligan M.P.s cannot participate in any parliamentary affairs and proceedings from 21st during the period of suspension .